Okay, I spent a good half hour earlier today slamming my head against the wall, trying to figure something out. Why my checkboxes in my tri-state tree were not getting set to the correct state based on user input. What this is, is each checkbox on the tree has three possible checked states: true, false and indeterminate. A checkbox's state is the summation of its children's state (if all children are TRUE, then it is TRUE). A checkbox is indeterminate when any of its children are not in the same state as itself. Pretty straightforward if you ask me, and the state was being controlled by a nullable boolean (which is declared DIM _isChecked as Nullable(of Boolean) in VB or Boolean? _isChecked in C#). Now, I'm using VB.Net for this, and when I only had a single set of children until you got to the lowest level, it all worked perfectly. I was happy and smiling. Well, today I shoved in extra children for every level that could have them, and got something... new for my troubles: only the first child was affecting the parent nodes, thus breaking rule 2, while modifying UP the tree. Modifying down, still worked like a charm. So, I'm off grumbling, and toss in a Breakpoint on the comparison operation. I mean, I see in the code where this value is supposed to be changed, and so that proverbial key to the kingdom is where I need to be looking. I start up the application, get to the point in it where I use the tree, and uncheck something. the break point fires, and the promptly skips over the code, confused, I let it cycle back around as it verify's the parent's state. Once I'm at the checkpoint again, I look to see what the result of the comparison operation is. Which means that the comparison did not fire, because their is no equilavencies between the two opposing states. Frowning, I considered the implications of this, when suddenly I realized what was happening. A nullable boolean, has three possible values: True, False and NOTHING. The problem exists because NOTHING cannot be processed through a comparison operation such as "=" or, as I was using, "<>." So, what was this poor programmer to do? What I had forgotten, was the nullable objects have a "HasValue" property which returns a boolean based on if the variable is NOTHING or not. One of these days, Blogger will support Code formatting, and I just won't know what to do. But I digress. 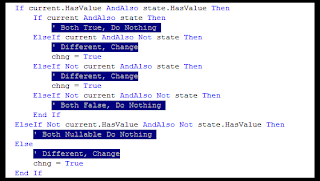 Now, if Microsoft had put a bit of FORETHOUGHT into their Nullable(of T) objects in VB.Net they would have provided inherent comparison operations between two instances of the Nullable(of T) objects. But that may be asking for a bit much I fear.